Alberta gets called a lot of things, most of them nice. One of the things we get called a lot, especially in the auto industry, is Truck Country. And for good reason. Everywhere you look, you see trucks. This isn’t nearly as apparent when you’re a lifer here and it’s what you’re used to. But it becomes clear as day when you leave Alberta. 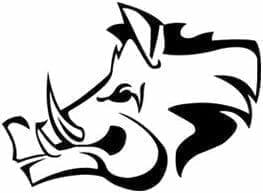 I was in Ontario a few weeks ago, and without exaggerating, several minutes could pass by while I was driving on the highway until I would see a pick-up truck. But you come back to Alberta, and anywhere you look, amongst a group of vehicles, there will be at very least one pick-up – often a whole bunch of them. We like our trucks. And so, it is with a true sense of duty that I reviewed two mechanical twins in the last couple of weeks. I’m doing this for the people. 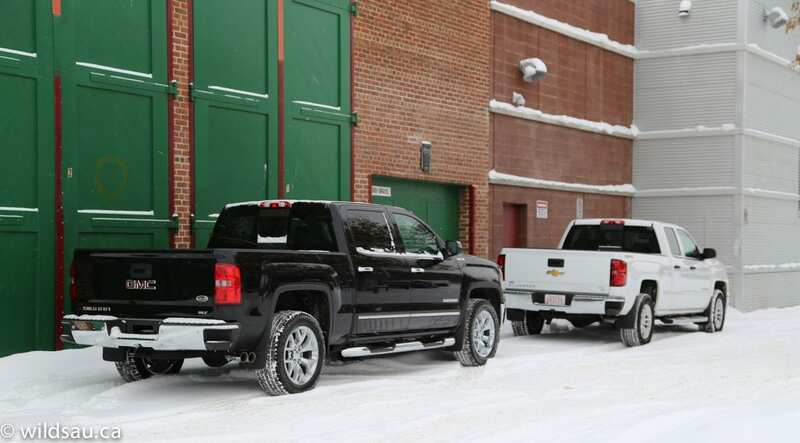 GM has long built these twins – the Chevy Silverado and the GMC Sierra. They’ve always shared all but a few parts, yet they’ve decided to keep the product lines distinct, each marketed toward a different demographic. 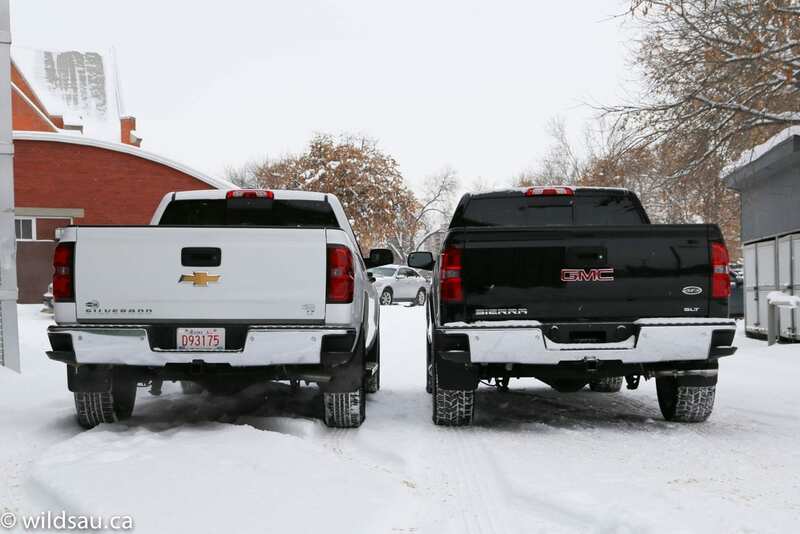 In the end, you’ll see it’s really a matter of preference, because even if you relied on a coin flip to choose between the Chevy and the GMC, you’d end up with the truck you want. By the way, if you’d like to check out what some of the competition is offering, here are my thoughts on a Dodge Ram and a Ford F-150. 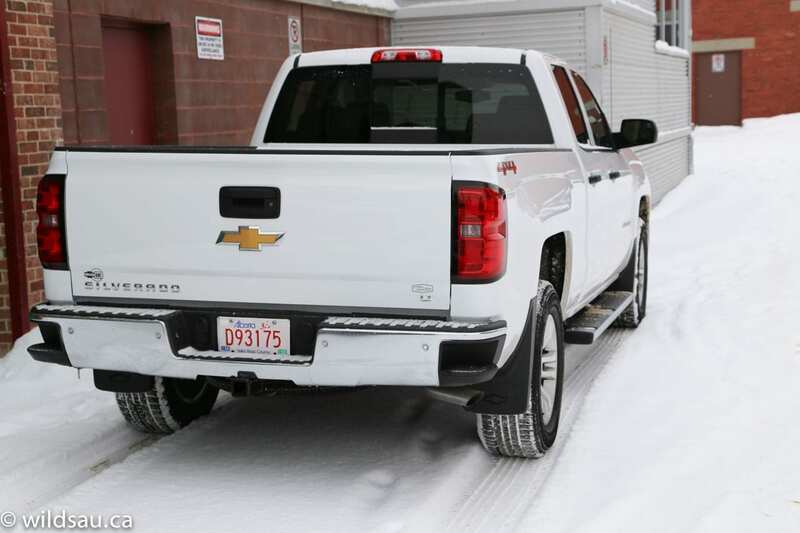 I wanted to look at two different trims – so the first is a middle of the line Chevrolet Silverado LT. It’s not a stripped-down truck, by any stretch. It comes well-equipped, and this one had several option boxes checked off as well. It’s the white truck in my pictures. 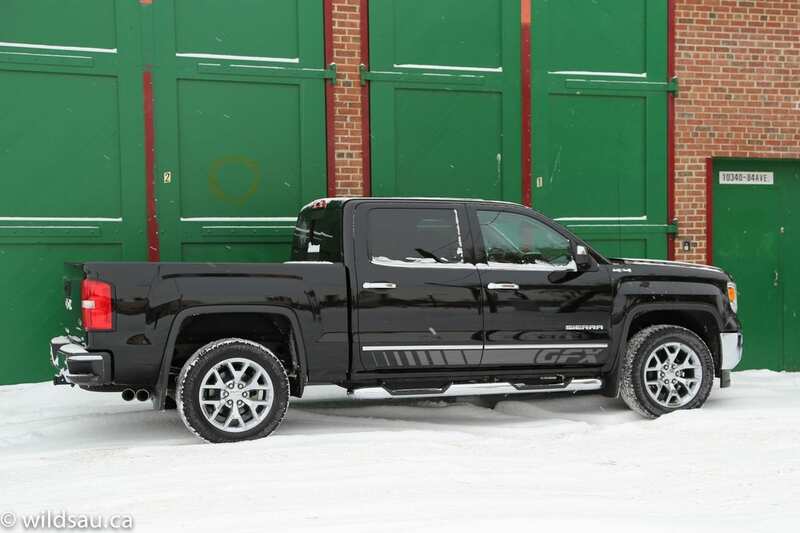 The second truck I drove was basically a loaded-up GMC Sierra SLT – a top-trim model, with options added on. This is the black truck. For the purposes of this review, I will be referring to them as Chevy and GMC. 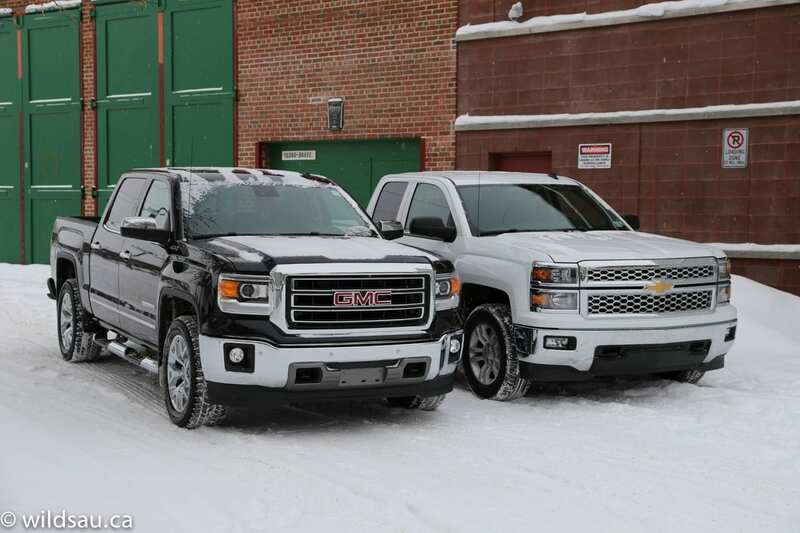 Please note that both the Silverado and the Sierra are available in nearly identical trim levels, so I’m referring just to the specific Chevy and GMC trucks I drove. Let’s just get this out of the way. Yes, trucks are expensive nowadays. There’s no getting around it. Of course you can buy a complete “work truck” with manual crank windows and a limp-wristed V6, but that’s not what most want, nor is it what most people buy. Trucks have become cars for many, who use them mostly to commute, get groceries and get the kids to soccer practice. The truck might also see some towing a few weekends a year, and might get muddy on rare occasions, but for the vast majority of its days, it’s going to do everything that a regular household car does. And for that purpose, people want their creature comforts. Not a problem. If you’ve got the money, you can get nearly anything in a truck that you can get in a car. Much has been said about GM’s 2014 truck models, with plenty of focus on the styling being too incremental from the last models. Not enough change. Just an evolutionary refresh. 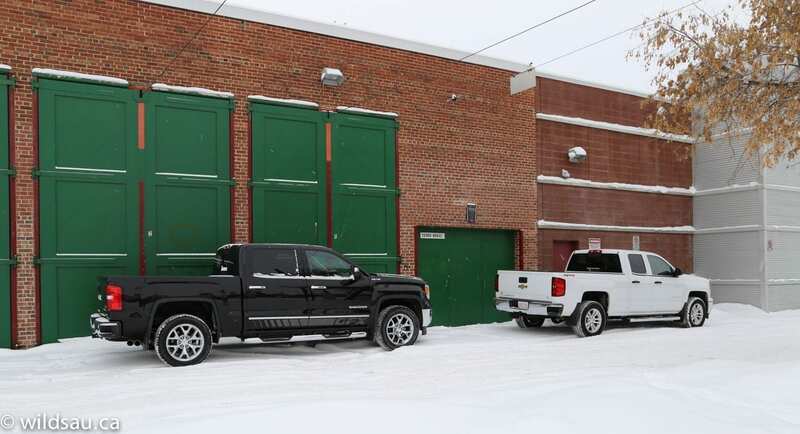 There’s no denying that GM has based the look on previous generations, and anyone will recognize these as GM trucks. But there are plenty of changes, and the new trucks boast a styling that is at once modern and classic. One of my favourite parts of the new styling is the use of massive square fender boxes. They really define the side profile of the trucks. Grilles have become significantly more pronounced – their rectangular mass and chrome surrounds takes over the front of the truck. The Chevy gets dual stacked headlamps, while the GMC benefits from slick LED driving lights and projector-beam headlights. Chrome bumpers front and rear look like they mean business while adding a touch of class – both front ends have integrated fog lights. Overall I found the 2014 GMs to have tidy, clean proportions that look just right. 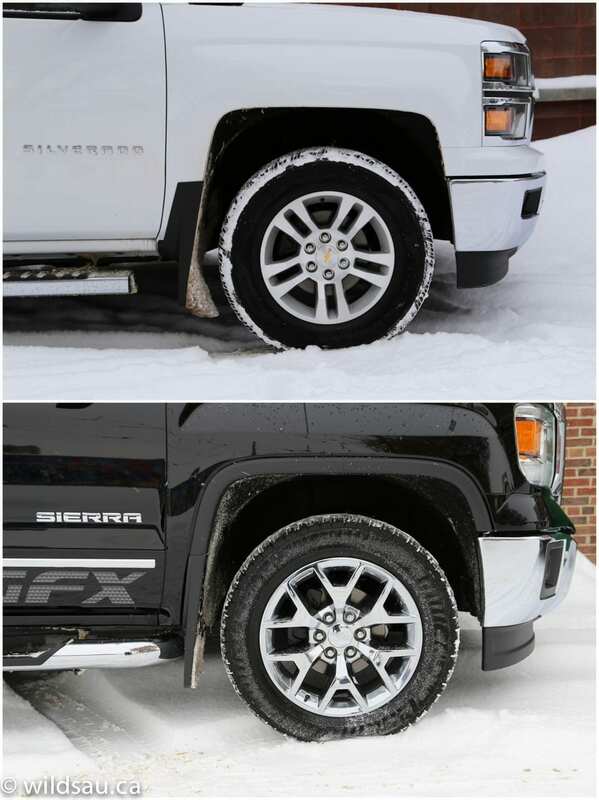 The Silverado’s rims look good (it has 265/65-sized tires on 18s) if not a bit small by today’s standards, but the Sierra’s 20-inch rims with 275/55-sized rubber are stunning. The Sierra I drove has a Ground Effects graphics package – it’s not too garish but still might not be to everyone’s liking. Of course, that kind of thing is optional. Both interiors are very similar, only differentiating themselves with a few of the materials used and some of the toys and gadgets that are included. 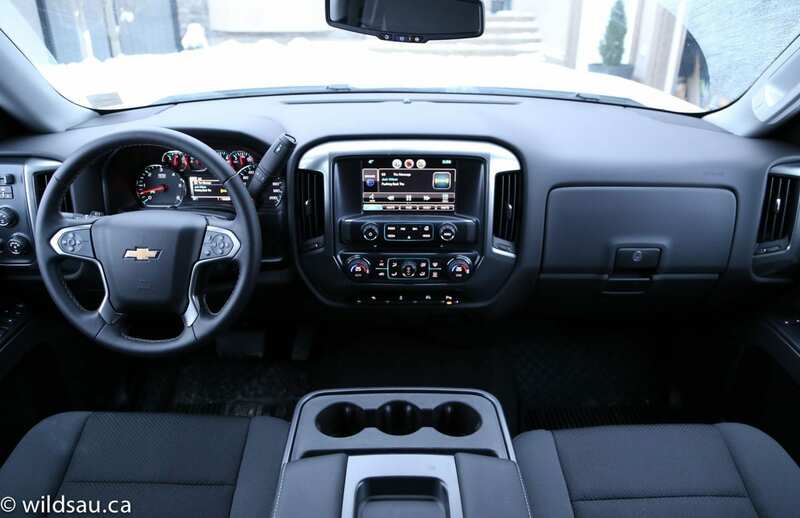 The Chevy’s dash is hard plastic, while the Sierra’s is upholstered in a stitched soft-touch material. Very upscale for a truck. The Sierra also had splashes of carbon fiber style trim around the cabin, as well as real aluminum pieces. Nice. The front seats were quite different on these two models. The Chevy has a three-seat bench, splitting 40/20/40. This allows the middle seat back to flip forward, effectively becoming a decent centre console. The comfortable seats are upholstered in fabric and the driver’s side is power-adjustable. The middle seating position has a lap belt and of course sits above a massive transmission tunnel, so leg room is … well, non-existent. The GMC is a whole different story. Power-adjustable heated and cooled leather-upholstered buckets on both sides – they’re nice to look at and more comfortable than the “bench”. Now that’s the life! The driver’s side seating has a memory function and there is no middle seat in the GMC. Both trucks have power-adjustable pedals, allowing you to make the truck’s driving position considerably more accessible for people of different heights. You’ll find a nearly identical instrument bin ahead of you in both trucks. There’s the typical truck instrumentation – 2 main gauges (a speedo and a tach) and 4 accessory gauges above – the main gauges are separated by a nice sharp 4.2-inch driver information screen. It allows the driver to access information on the vehicle’s fuel economy and range, etc., audio, phone, navigation and vehicle settings. Not only can you get this information, you can also control much of it within the screen. It’s a very useful set-up. The steering wheels in both have buttons for the cruise control, handsfree/phone, and the driver information screen. On the back of the steering wheel are buttons for the audio system. 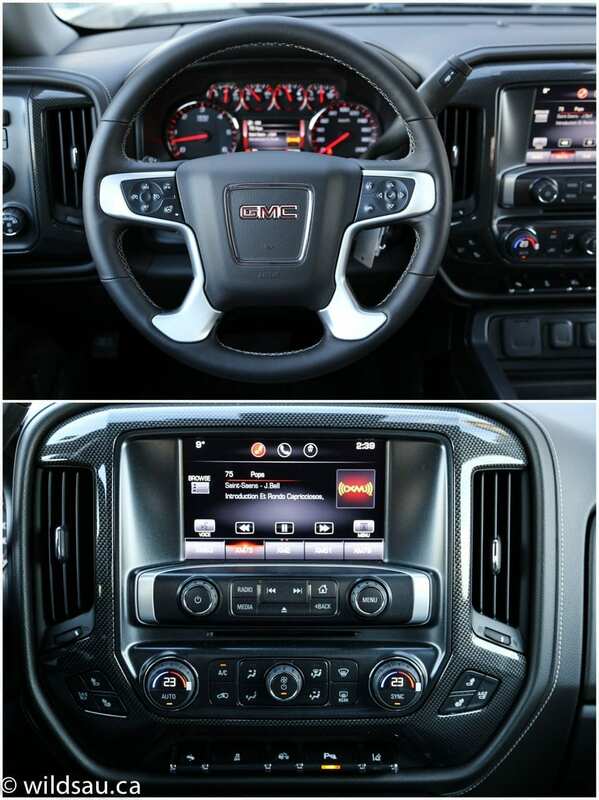 The GMC’s steering wheel is heated – a very nice feature during these cold Alberta winters. There is more of a centre pod instead of a stack in these trucks. 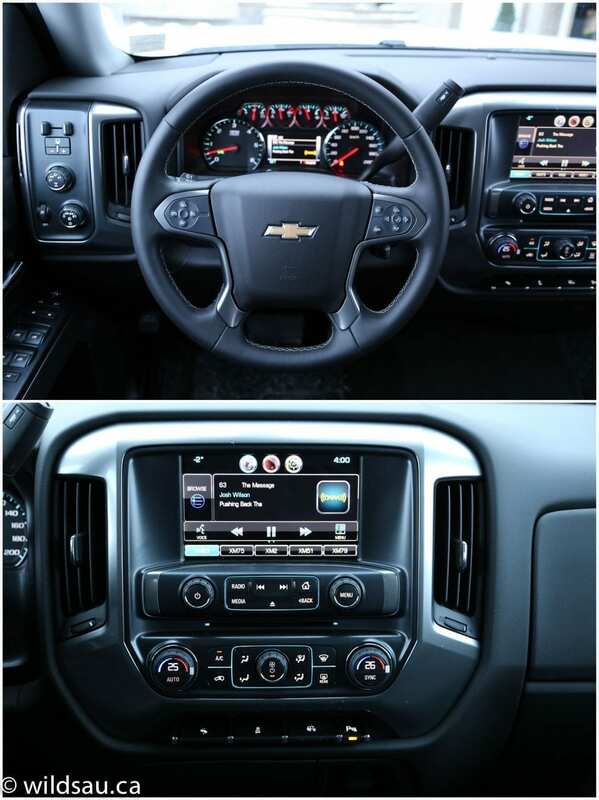 It starts with an 8-inch touchscreen (the systems are called Chevy MyLink and GMC Intellilink). It has a very straight-forward user interface. I found it easy to comprehend and use. It functions with a combination of touch-screen and a few, basic hard buttons and a couple of knobs and handles phone, audio and vehicle settings – the Sierra adds navigation to the mix. The screen is very responsive, easy to read and a very simple, effective nerve centre for the vehicle. On top of that, I found the voice recognition to be one of the fastest and most accurate I’ve used to date. The Chevy Silverado’s audio is acceptable. 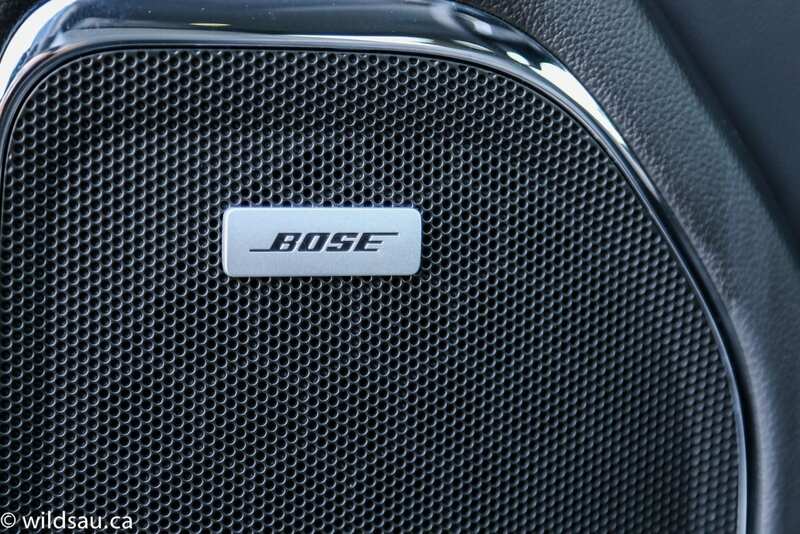 The GMC Sierra’s BOSE sound system is definitely an upgrade, but still nothing special – both feed off a large variety of sources. 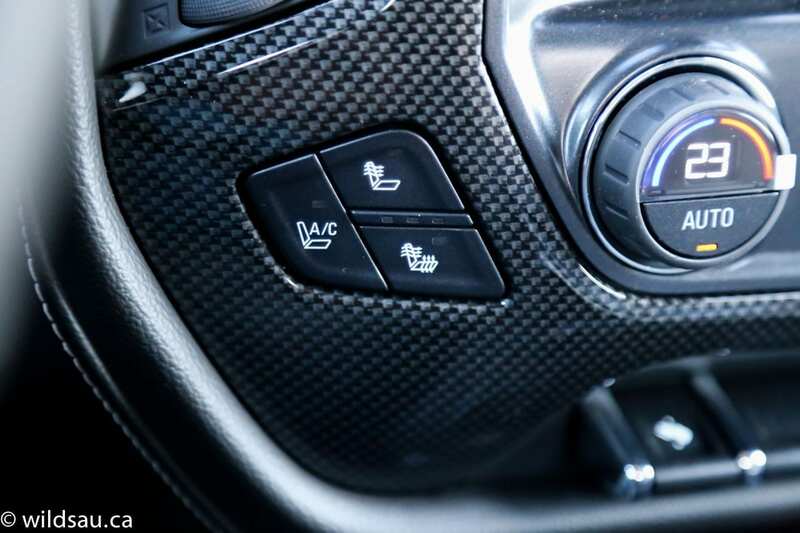 There’s a dual-zone automatic climate control system below the screen and there are upper and lower glove compartments. The Chevy has rather limited driver assistance technology – a back-up camera (with handy trajectory lines showing you exactly where you’ll end up) and audible rear distance parking sensors. 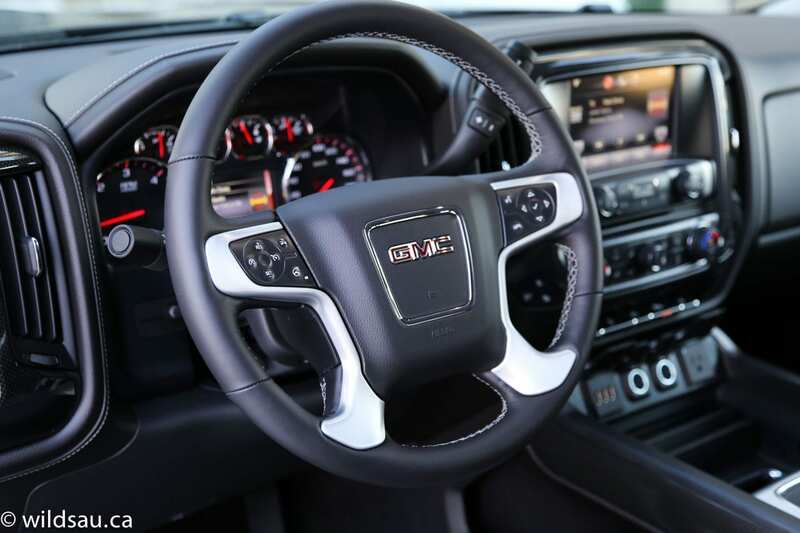 The GMC has those and adds some major goodies here – Forward Collision Alert and Lane Departure Warning, visual and audible front (and rear) parking sensors and this cool seat vibration alarm. It will send gentle vibrations through either or both sides of your thigh cushions. If you’re about to hit someone, both will vibrate. When you’re parking, it’ll vibrate on the side you’re getting too close to something with. If you’re drifting out of your lane, it will vibe on the side that needs your attention. It’s a bit unsettling at first, but you quickly get used to it and start to rely on it for things like parking. Both trucks are started with a traditional key, and both have remote starters. I found the GMC’s power-folding mirrors highly useful when parking in tighter spaces. Both trucks feature a bench seat with three seats that splits 60/40, allowing you to fold either or both sides up, creating a wealth of uninterrupted cargo space to work with. There’s plenty of head room here. The back of the centre console features a couple of storage spaces, as well as a 12V plug. The difference between the two trucks came in the trim and size. The Chevy’s bench is fabric and the double cab doesn’t offer a ton of leg room back there. It was acceptable for my 5’10” frame but not much more. 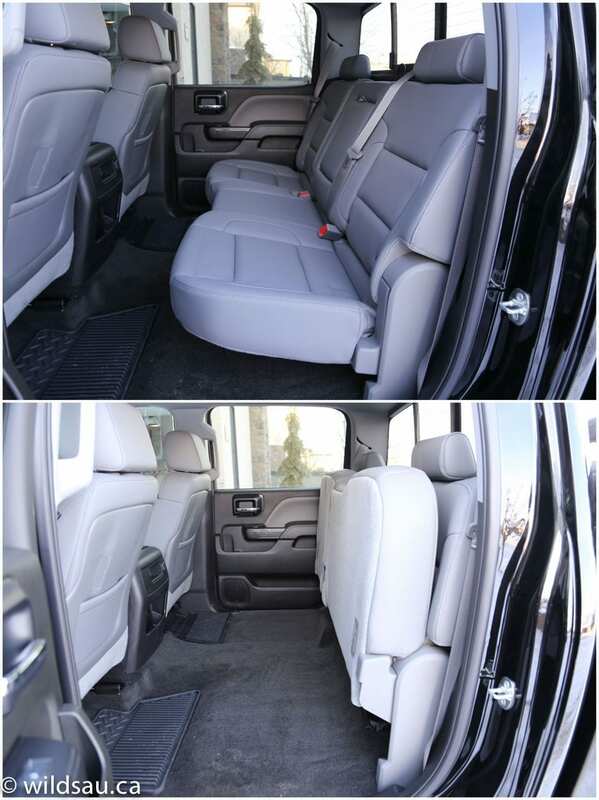 The GMC, on the other hand, has leather seats and its Crew Cab brings way more leg room to the table. It allowed us to put an entire day’s shopping in front of our kids’ legs and everyone was comfortable. It makes a big difference. It also has a flip-down panel in the middle seatback that becomes an armrest with a dual cupholder. 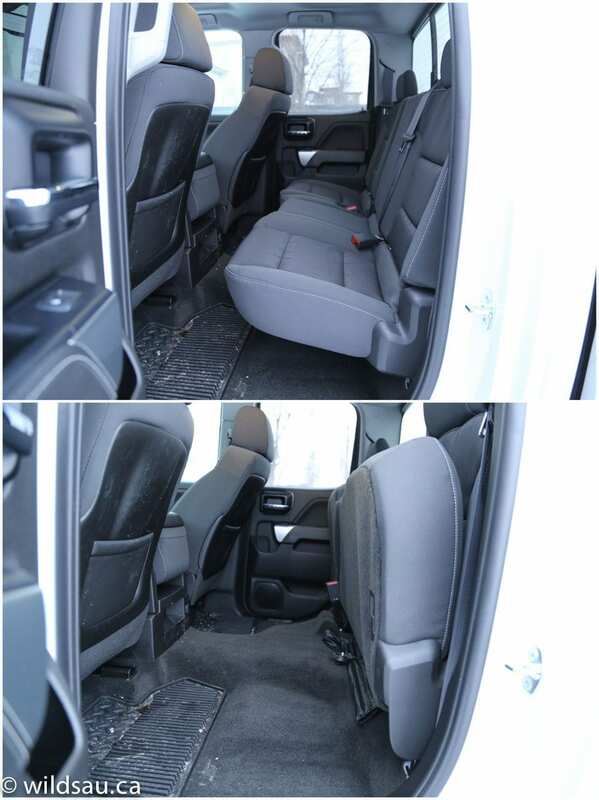 Both trucks have two sets of LATCH anchors for child seats and had plenty of space (width-wise) for our three children. The floor is nearly flat, with a barely noticeable hump in the middle. 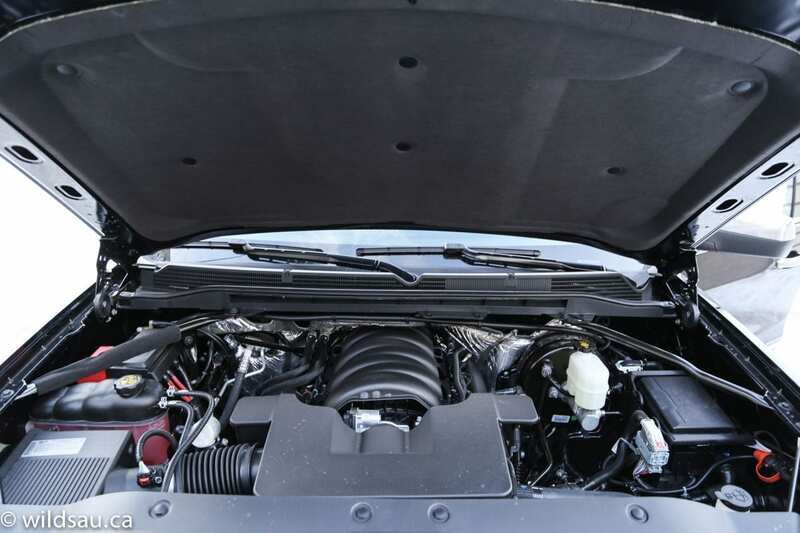 GM’s 5.3-litre EcoTec V8 sits in the engine bay, taking up woefully little of the real estate in there. It cranks out 355 horsepower at 5600 RPM and more importantly, a healthy 383 lb.ft of torque at 4100 RPM. 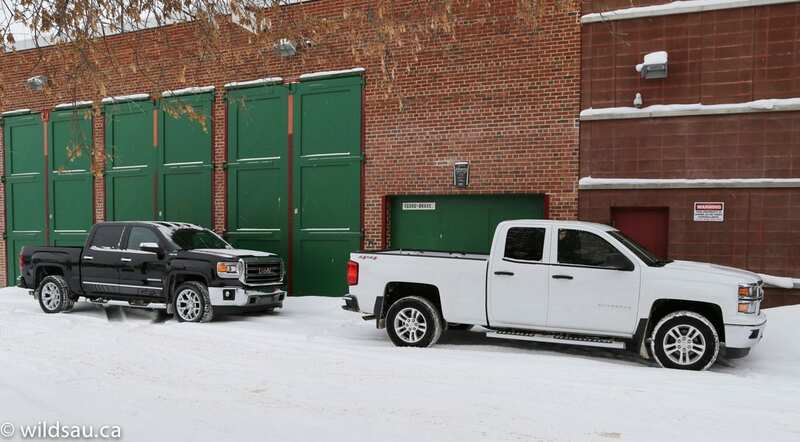 My average in the trucks was nearly identical – 16.0 L/100 km in the Chevy and 15.9 L/100 km in the GMC – that’s 15 US mpg in both. Both trucks were brand-new, so my own mileage isn’t really worth talking about since the engines were still too tight and will obviously provide better efficiency after being broken in. These trucks come with a 98 litre tank – opt for a long box (only available with a regular cab) and that increases to a 128 litre tank. Power is routed through a 6-speed automatic to a 2-speed (High and Low) 4×4 transfer case. Inside you’ll find a simple electronic rotary dial to control it. The 5.3-litre V8 is a great engine. It’s quiet, powerful from the lowest RPMs, smooth and is rated to be quite efficient. I found it provided ample pull off the line, all the way up to highway speeds. The transmission has its moments. It’s mostly smooth and mostly intelligent. Though a slow shifter, it tends to figure out what gear it should be in most of the time. I did find it occasionally trying to figure out where it should be though, and occasionally it got a bit clunky during gear shifts. 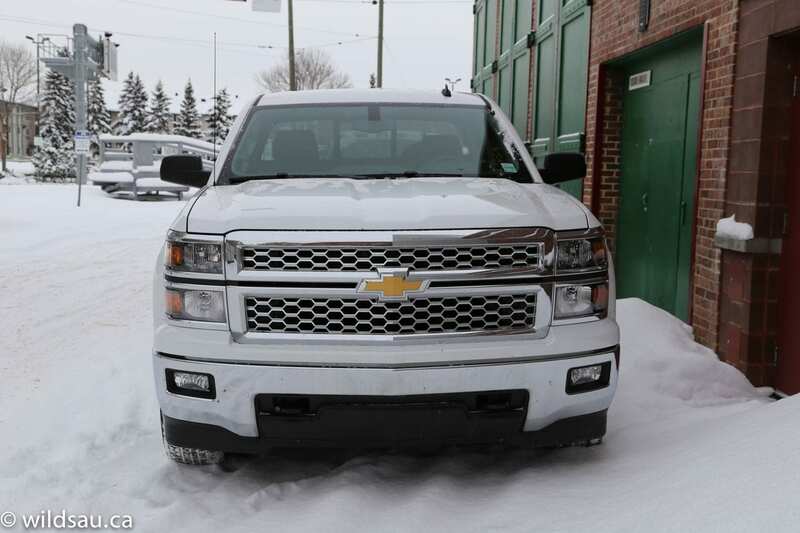 The GM trucks have a really refined ride, soaking up all the hits our snow and ice-covered Edmonton streets could come up with. I really liked that the trucks felt very solid and rigid while driving – in my opinion, more so than any other trucks I’ve driven to date. Yes, when you hit a series of road irregularities, the chassis still get jittery as any truck’s will, but it seems like many of the vibrations you expect when driving a truck have been tuned out. Handling is as expected. You’ll never get sharp turn-in or canyon-carving capabilities from a conventional truck, but for any normal city driving and high-speed manoeuvring, the 2014 GMs did just fine. 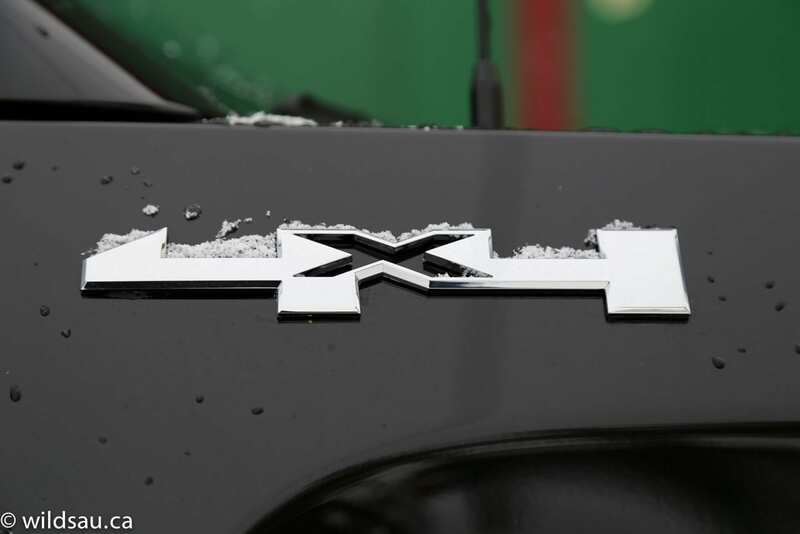 The 4×4 has an automatic Autotrac mode which is very effective, even in a fresh snowfall. There’s a bit of slippage and the front wheels kick in – for nearly all driving situations, it was excellent. In deep, heavy snow, I felt regular 4×4 mode was better. I found that the whole driving experience was quiet – noise levels are well managed around town and on the highway in terms of the engine, road and wind. 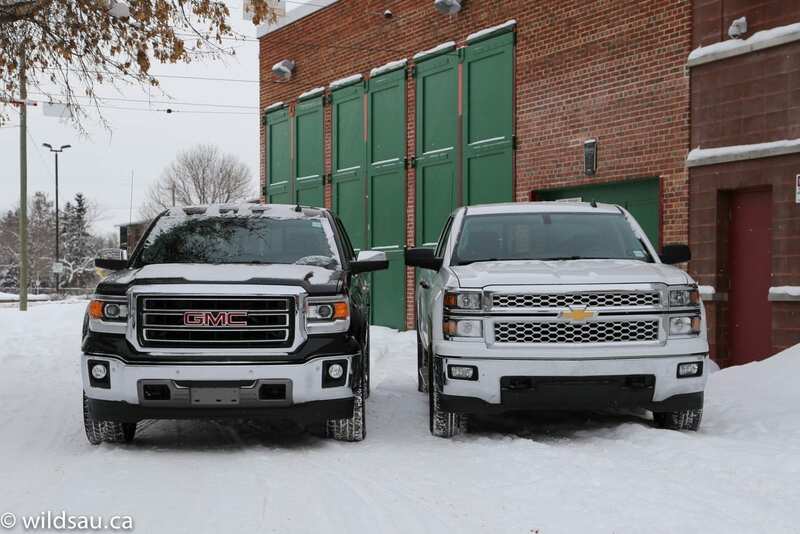 As work-trucks, the GM twins offer a lot. Both had nifty little touches like integrated rear bumper CornerSteps, and hand-sized holes on top of the box sides, making it a quick climb up. 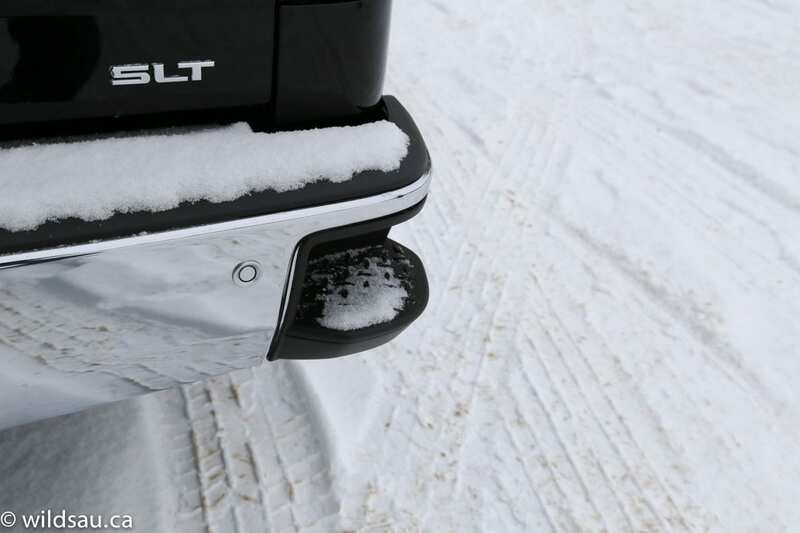 If you’re towing, there’s a trailer brake with gain adjustment, trailer sway control, intelligent brake assist and of course a Tow/Haul mode. 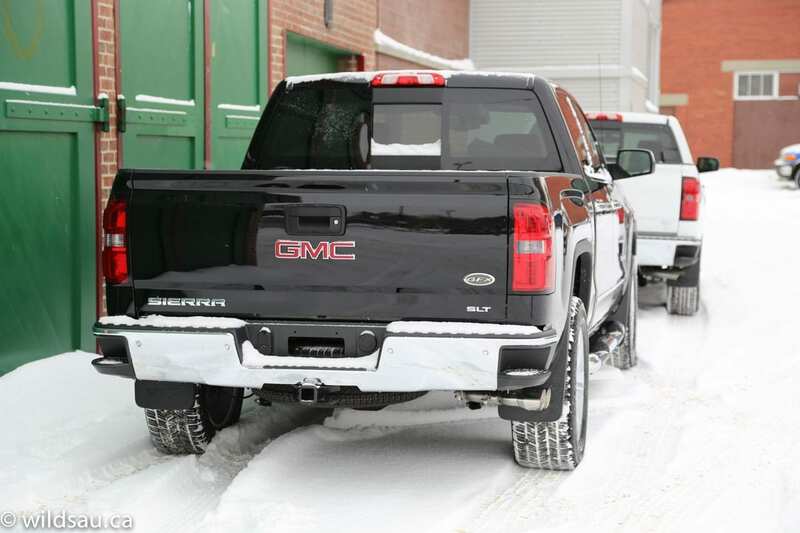 Outfitted with the Max Trailering package, these trucks can tow up to 11,500 pounds. Impressive! 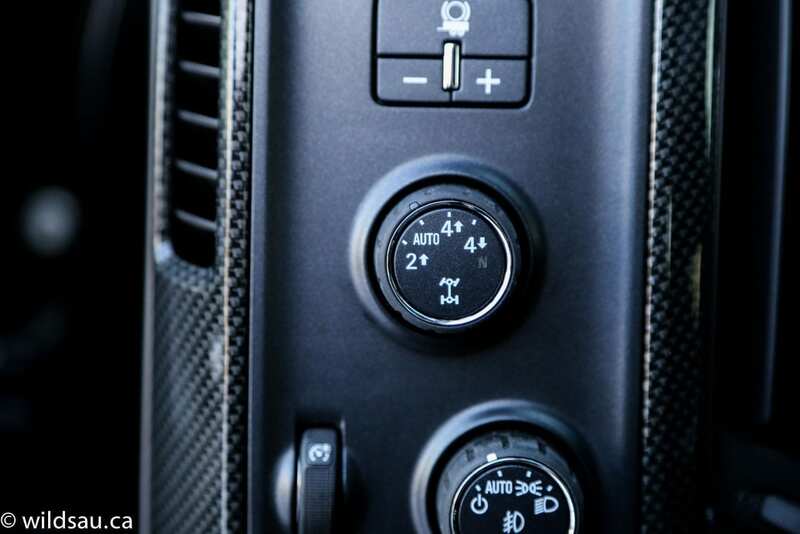 If you need to direct the truck’s power more precisely, the gears can be shifted manually using a goofy thumb-toggle on the column-mounted shifter. And if you’re headed off-road, there’s a hill-descent mode – I tested this out in Ontario on an off-road course and it’s effective in letting you descend significant grades without using the brake, letting the truck do the work for you. Of course, much of today’s truck work takes place in the cabin, as they’re often considered mobile offices. Both trucks excel here too. The Chevy has a little swing-out storage bin under the dash, and a 12V plug. When the front middle seat is folded down, it provides you with a console that offers triple cupholders, three organizer trays behind that, and a reasonably-sized storage bin under the armrest lid (which has a rubberized drop-in tray on it) including some organizers. Here you’ll find two USB plugs, an auxiliary plug and another 12V plug. Again, the GMC is a whole different story. 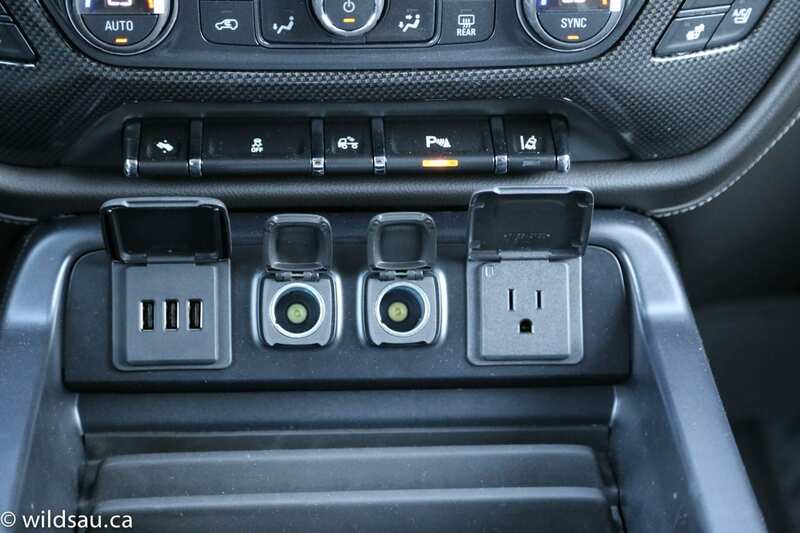 The front of the console starts with a veritable charging station. Three USB plugs, two 12V plugs and a 120V household plug allow you to power or charge a bushel of electronic things simultaneously. 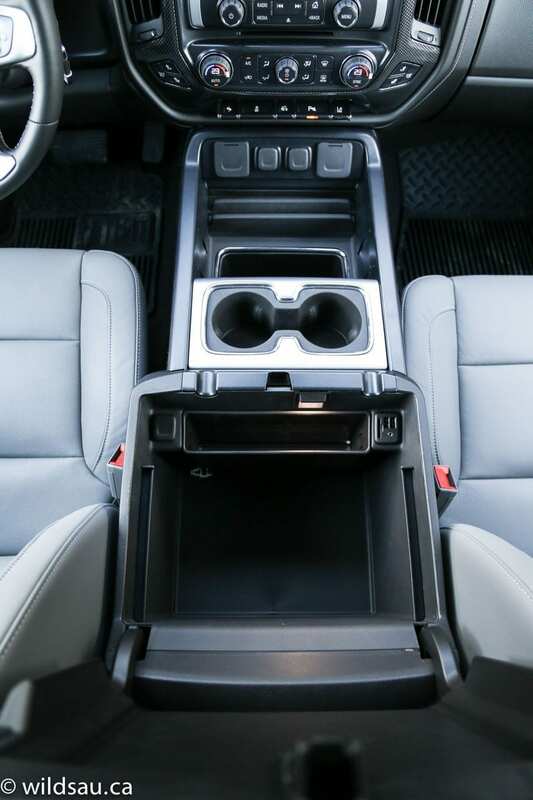 Behind that is a deep, open well – floating above it is a moveable dual cupholder, which allows you to put it near the front, the middle, the back or just remove it completely. And under the armrest sits a bin so large, it can accommodate hanging file folders, laptops and much more. 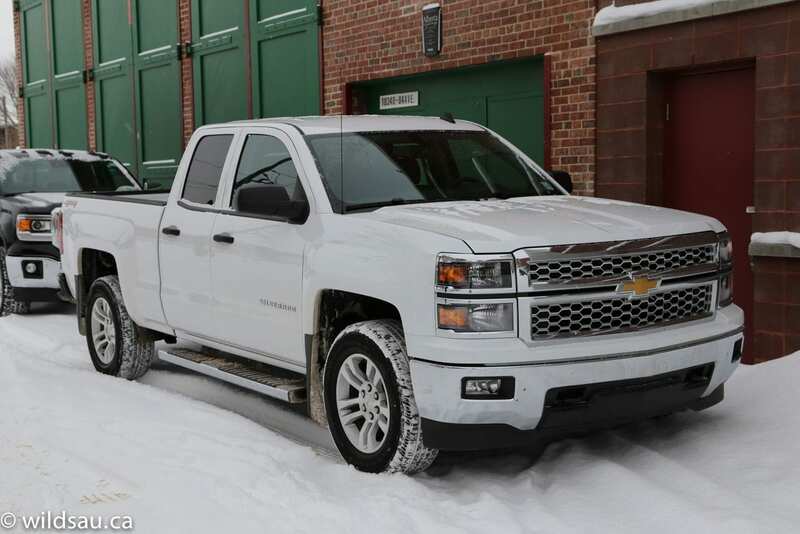 I found myself highly impressed with GM’s 2014 truck offerings. As I said at the beginning, short of some minor trim differences and slight styling elements, the Chevy and GMC trucks are the same. Underneath the sheet metal, they are the same. Both of them did a great job with the city commute, always being comfortable, quiet and refined. Both handled the highway as well as they cut through freshly fallen snow on residential streets, and had plenty of power in every situation. WAF (Wife Acceptance Factor) was high. She really enjoyed the high seating position and the view of the road. She always says she feels safer when she is driving a truck. 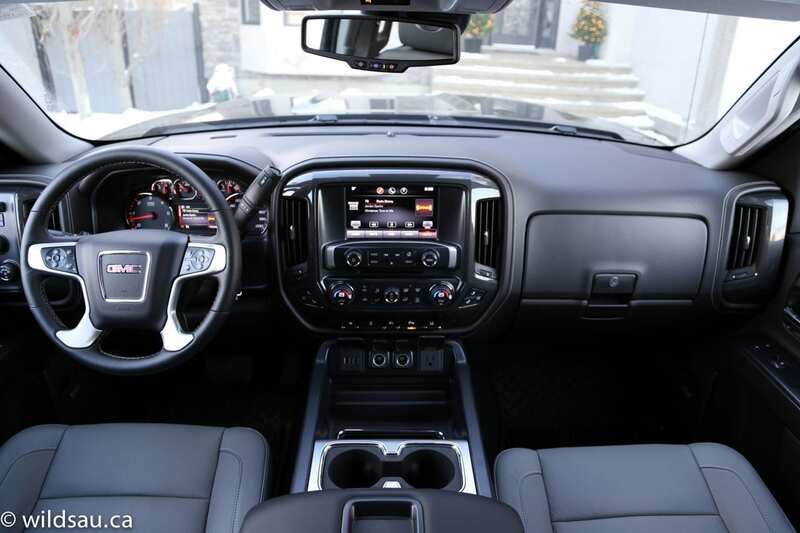 Her vote definitely went for the GMC Sierra, as it was pretty nicely kitted out obviously – she loved the heated leather seats and the nicer interior trim, as well as the more high-end touches on the exterior. No surprise though that she didn’t enjoy the parking aspect – these things are behemoths, and there’s no way around trying to fit one of them into a parking space. I have been a big fan of the recent Ford F-150 offerings. I still am, of course, but now I wouldn’t hesitate to recommend GM’s 2014 trucks, regardless of the trim level you need or want. The styling is my favourite of the trucks at the moment – it looks substantial, modern, clean and hunkered-down. 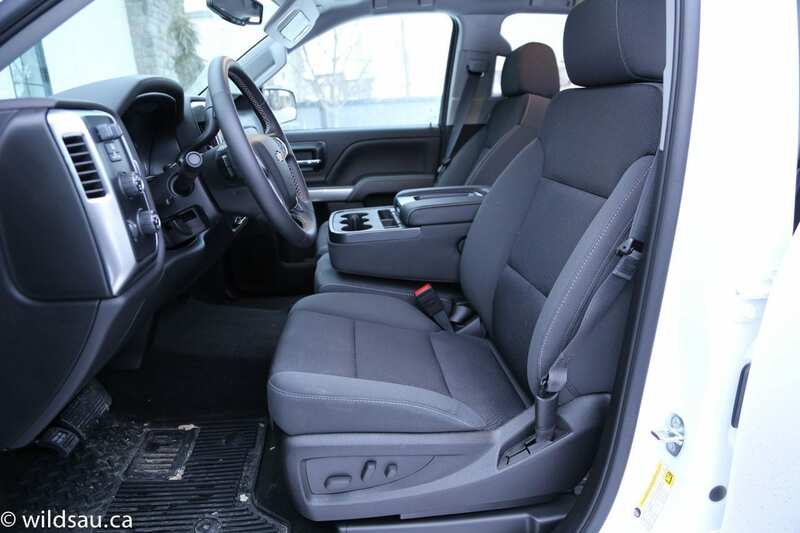 The interiors provide a wealth of effective, well thought-out tech, convenience and comfort that easily competes with the other trucks out there. 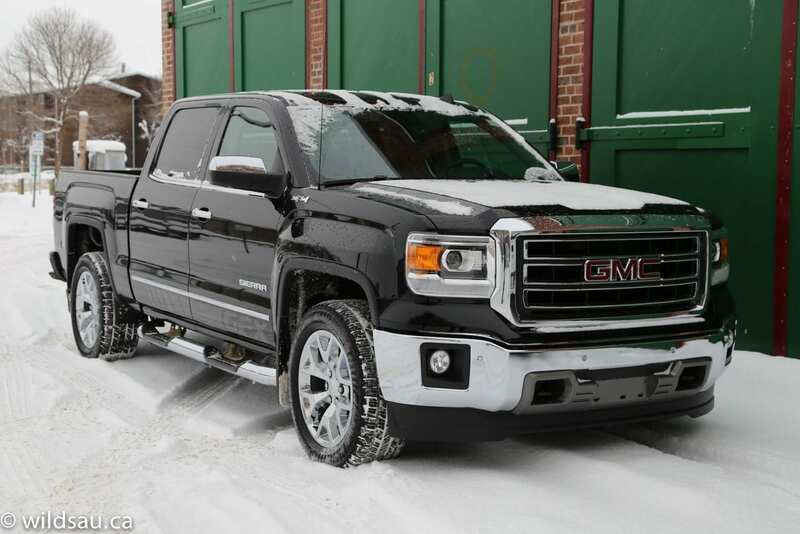 If I was in the market for a truck, and I’d determined the 2014 GMs were the right fit for me, I’d be buying a loaded 2014 GMC Sierra. Is it expensive? Yep. But so is the competition. 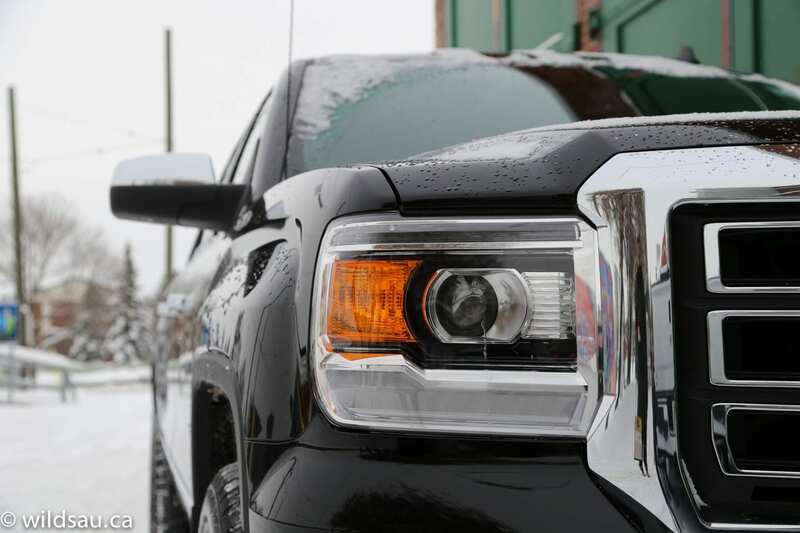 I loved the ride, the looks, the tech, how solidly built the truck felt and the poise with which it ate up the miles – around town and on the highway. I’d love to tell you that everything was rainbows, rose petals and puppy dog tails, but alas, on my last day with the second truck, the GMC Sierra, I fired it up and found a “Service Power Steering” warning. This is actually a much more dire situation than it sounds like. Steering a land leviathan of this size and mass without the assistance of power steering was difficult at best, and nearly impossible at lower speeds in tighter spots – like the underground parkade I use every day! Not only that, but I’d be pissed off if I spent nearly 60 grand and my power steering gave out in less than 400 kilometres. Let’s just say it made for a long drive in to work. Equally irritating was the fact that at the end of the day, when I got in after work, my shiny $57,000 friend had found his power steering again. Unexplainable, quirky and annoying. Disclosure: Vehicles were provided by Don Wheaton Chevrolet Buick GMC Cadillac.